When you think of metal fabrication tools, what comes to mind? Most likely the cutting tools or maybe even the good old-fashioned welding torch. In truth, our most powerful tool is technology – especially the technology that allows us to visualize and refine a design before a single piece of metal gets cut. 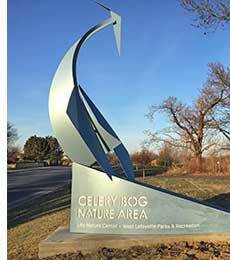 Take, for example, a sculpture called Heron that was recently installed at the entrance of the Celery Bog Nature Preserve in West Lafayette. The artist, Jeff Laramore, came to bo-mar with a cardboard model of the sculpture. We then created a 3D model using SOLIDWORKS computer-aided drafting software. From there, we sat down together to fine-tune some design nuances – a little more arc here, a little less arc there. All told, it took about two hours to get the design exactly how he wanted it, and then we went straight to production. Compare that to the days or even weeks it would take to refine a design after it’s been fabricated. We took a similar approach with the 60-foot-tall torches that greet you as you drive into Mooresville, Indiana. The torches were installed in January at the north and south ends of town as part of the state’s Bicentennial celebration. We modeled the 10-foot-tall metal flames using 3D technology before we cut them – which allowed the designer to get them just right before cutting. 1. Precision – I like working with perfectionists because I’m one too. With 3D modeling, we can work together to make sure even the finest details are just right. When you fabricate something without modeling, you might settle for imperfection – but with 3D modeling you don’t have to settle. Plus since the design goes straight from the computer to the cutter, things don’t get lost in translation. What you see in the model is what you get in real life. 2. Shortened production time – Thanks to 3D modeling, artists and architects can get the design right from the start, so it only needs to be built once. That can shave days, weeks, and even months off the production schedule. Also, you can use 3D modeling to avoid design issues that a drawing just can’t predict – like weaknesses that can cause production delays down the road. 3. Financial benefits – Producing something right the first time, therefore avoiding rework, is a simple way to cut costs. But there are other ways 3D modeling can help your bottom line. For instance, when I collaborate with customers on the design, I can often find ways to reduce production costs by suggesting minor (and often unnoticeable) design tweaks. As the word is getting out about the benefits of this technology, we’re getting a lot more calls from artists who want to model their designs before production. It’s an honor to collaborate them and to help bring their vision to life.